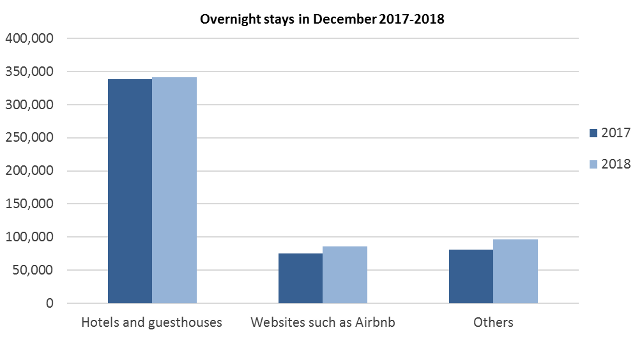 Overnight stays in all accommodation in December 2018 were 523,600, compared with 494,400 in December last year. Overnight stays in hotels and guesthouses were 341,300, overnight stays in apartments, youth hostels, campsites etc. were 96,300, and overnight stays through websites such as Airbnb were approximately 86,000. There was a 4.3% increase in the total number of overnight stays in December between years, thereof a 0.9% increase for hotels and guesthouses, 18.5% increase in other types of accommodation and a 15% increase in private accommodation through Airbnb etc. Additionally, overnight stays in cars other than at campsites were 3,000 and the number of overnight stays with friends and relatives, through exchanges or in other places where no payment was made, was 13,000. 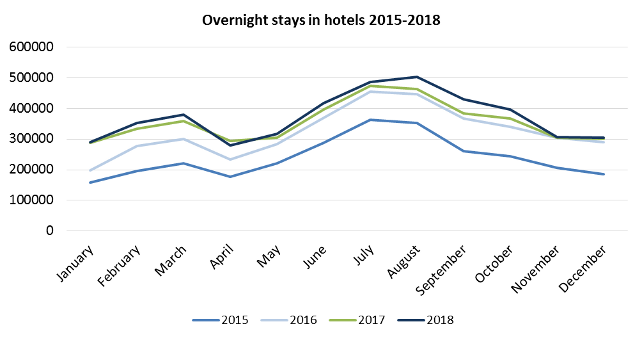 Overnight stays in hotels in December 2018 were 305,200, which is a 1% increase from December last year. There was a decrease of overnight stays in hotels in the Southwest and Capital areas, but a marked increase elsewhere. Around 68% of all overnight stays were in the Capital region, 206,700. Occupancy rate for bedrooms in hotels was 54.0% in December 2018 and decreased by 4 percentage points from December 2017, when it was 57.9%. Over the same period, the number of hotel bedrooms has increased by 8.3%. The occupancy rate for bedrooms in December was highest in the Capital area, or 71.4%. Nights spent by foreign tourists in hotels were 276,500, which accounted for 91% of the total number of overnight stays in December. USA residents had the greatest number of overnight stays (82,500), then residents of the UK (75,100) and Germany (12,200). Overnight stays of Icelanders in December were 38,300. The total number of overnight stays in hotels was 4,466,000 in 2018, which is a 5% increase from the previous year. Overnight stays in hotels in the West and Westfjords region increased by 29% between 2017 and 2018, from 191,000 to 246,700. There was also a 16% increase from year to year in the South region, from 774,100 to 894,300. Overnight stays in the Capital region were 58% of all overnight stays in hotels in Iceland in 2018. Numbers for 2018 are preliminary, as well as 2017 data for overnight stays for unpaid and private apartment accommodation.